You didn't hear it here first, folks: Nonplayer #2 is done and in the can. When will it be on the stands? Looks like I juuuuust missed the Previews deadline for April, so probably May. Yes, it feels like a long time from now. It's after Emerald City, where I would very much have liked to debut the comic, which makes me sad. My best convention option right now is San Diego in July, but obviously I've completely missed the window for reserving a table. So if anybody has a table at SDCC that they'd like to share with me, please drop me a line. I swear I don't smell that much worse than the usual convention-goer. I am happy to pay for my portion of the table. Will there be a reprint of issue 1? I have asked for this but have not yet received an answer in the affirmative (which isn't to say the answer is "no" -- Image is pretty busy these days). If you want to help this cause, feel free to tweet @ImageComics to remind them that you'd like to have access to the first issue. This is especially important because A) it turns out lots more people buy Image comics these days, and low supply is making copies of issue 1 ridiculously expensive and B) the second issue is pretty dense, and though I don't believe it's completely incomprehensible on its own, it's a much better experience if you know what happened in #1. Are you going to do any signings? Yes, I think so. As long as it's a reasonable driving distance from Seattle. I'm already talking to Arcane Comics in Ballard (they're my home shop). If you run or work at a comic shop in the area and you'd like to put together a signing, please contact me! Are the other media rights for Nonplayer available? Why yes, it turns out that Warner has decided to let their option lapse, so Nonplayer is back in my hands. And no, nobody has actually asked this. I'm pretty shameless. Why the heck did it take so long to make issue 2? I think the answer to this one is going to comprise the remainder of this post, so let's move down from the oppressive confines of this Q and A format. See you in a second. Okay, so here's what happened. The first issue took just a hair longer than a full year to complete. That was me working without a deadline, without any scrutiny from any kind of publisher or press, using Photoshop (a program with which I was very comfortable). So that's our baseline. A year. A very long time by comics standards, but within an order of magnitude of the amount of time detailed comics have taken, historically (see Darrow, Geof or French Comics, all). Future issues of Nonplayer needed to be at least as handsome as that first one, so it was destined to be a slow ride from the start. But exactly how slow, I had no idea. When Nonplayer #1 was released, a few things happened. As I have detailed here in the past, there was quite a bit of distracting hoopla (at least by my standards). Between promoting the book, fulfilling poster and comic orders, Googling myself, hanging out with all my new comics friends, talking to Hollywood big shot types, and trying to answer every comment on DeviantArt in a meaningful way (man, that was cray), the amount of time left in a day turned out to be quite small. So regret #1 is not having made more hay while the sun was out, because I had a finite window of full-time access to the comic, and a lot of that time was spent on things other than drawing. On top of that, life took a turn for the lame almost immediately after issue 1 hit the stands. I have debated the wisdom of sharing this aspect of my experience with the public because it might feel like a play for sympathy, but since it was such a major feature of my life at the time (and now), I feel that there's no reason to conceal it anymore. On the same week that issue 1 was released, I got a call from my stepdad in Ohio about my mom being ill. It turned out that she had Pick's Disease, a rare form of early-onset dementia, the symptoms of which had been manifesting for a couple of years prior to her diagnosis. We'd had a couple of weird Christmases in Ohio, but somehow we'd managed to convince ourselves that she was just developing hearing problems. One thing about mom's illness that is particularly beautiful and heartbreaking is that her coworkers and boss apparently loved her so much that they covered for her for almost two years before finally letting her go. Her work performance had deteriorated to the point that her presence had become actively harmful, and everybody just worked around it, which is a big part of why her family never suspected that anything was going seriously wrong. So to the good people of Vorys, Sater, Seymour and Pease, thank you so much for taking care of her (and by extension, her whole family) for so long. Anyway, once the diagnosis was official, Mom and Mike moved straight to Seattle so that we could be together while she was still herself. I wish I could have spent more time with her. But I saw her at least once or twice a week, and she got to meet her grandson a few months before the end. She passed away last year. No, Nonplayer 2 isn't late because my mom got sick. But her decline formed the backdrop for a couple of very unpleasant years. I crashed my bike a few months into the project and broke my collarbone, which put me out of action for a couple of months. Then the money ran out, and despite my best efforts to get a second title going, things just didn't click. Meanwhile, I ended up having to throw out the original first six pages of #2. They felt like they had been drawn by somebody whose eye was not on the ball, which they were. When I finally shook off the brain-fog and gave the first pages an honest read, it was clear they'd have to be redone. Super bummer. On top of all that, I had contrived to switch from Photoshop to IllustStudio to streamline my pipeline. Not only did it take me a while to get comfortable with the new interface, the work I did with the program felt lifeless because of the way the linework was automatically stabilized. I finally found the right settings to replicate the feel of the first issue, but that took time. And then time ran out. I went and got a job at another game company. And while the people I worked with were lovely and talented (and many of whom are still close friends), it was a very demoralizing time for me. I remember sitting at my desk at work a couple weeks into the job and just wallowing in self-hate and resentment. I fantasized about walking out the door and roaming the land like Caine, with nothing but my Cintiq strapped to my back, drawing Nonplayer at diners and coffee shops across our great land. I'd just spent a couple of years working on the Thing I Loved, and now I was drawing gems and elves for a freemium mobile game. They gave me money and were really nice to me, but every minute I spent there was a minute not spent on Nonplayer, and a minute I'd never get back. It felt like slow death. And then after two years there, they canceled my project. So that whole period is just kind of a weird pause in my life, career-wise. It was during that time that I started working on Nonplayer in the very early morning hours. I joined the Holy Order of Viking Draftspeople, a group of other artists who were also working on personal projects in the wee hours of the morning (see #HOVD on Twitter -- lots of people there still working on rad stuff). Progress was excruciatingly slow for me. An hour or two every morning, just adding a few more lines, a little bit of color, and then off to work. With time at such a premium, my blogging stopped almost completely. Every once in a while, folks would poke at me or wonder where Nonplayer had gone, and there wasn't really anything I could show or tell them. I was half-done with the book and was literally getting a face drawn one day, a hand the next day, a telephone the day after that. It was like crossing a desert on all fours with no oasis in sight. The whole point of Nonplayer had been to work on something that I loved, but under these circumstances, it was no longer fun. The end was nowhere in sight, and I was getting a lot of disappointment and hate from fans, retailers, and even friends. I felt like a total failure. My office was a couple of blocks from Zanadu Comics, and I had to walk past that shop on occasion. The embarrassment I felt was so great that I sometimes crossed to the other side of the street to avoid having to face what had come to symbolize my total failure at life. My coworkers would sometimes go inside on their lunch breaks and when I tagged along I felt what seemed like a physical weight on my shoulders. They had a signed poster from issue 1 on the wall, which made me feel bad until they took it down, which felt even worse. I was in a bad place! I really thought about quitting. My work on the book slowed even more. I played Kerbal Space Program. I got super into SpaceX and rocketry in general. I doubled down on cycling, bought a fancy road bike, and started going after Strava records. I got a little happiness wherever I could. Especially in winter, it was hard to find reasons to be happy. My wife carried me through this time, and I'll be grateful for that forever. When I bogged down completely, she offered to help the process move forward by helping me out with flatting. Just having that vote of confidence was a huge help. 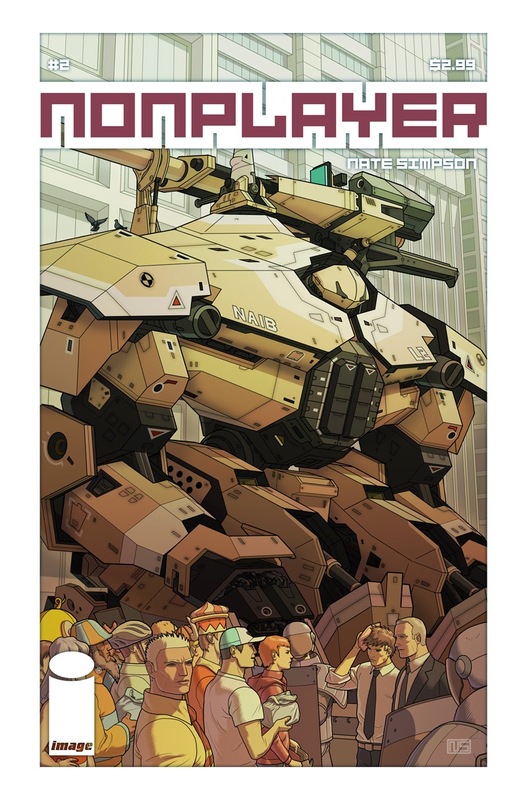 A few other folks still gave me encouragement online, but without Jiyoung's support, I would have thrown in the towel (I'd like to add that I also received enthusiastic flatting assistance from Matt Harding, who did an amazing job -- you should buy his book PopApocalypse right now). And then in May 2013, my son was born! For all the extra lost time that his arrival entailed, it also forced me to focus. Yes, on many mornings he would (and still does) choose to wake up at 4 AM, completely disrupting my work. But his arrival also got me to stop playing video games (haven't touched one in more than a year), and to be more pragmatic about my goals. He got me thinking long-term again, and I wanted to show him that there was value in making progress on something, even if that progress came in small increments. That, and he just makes me happy. You work better when you have happy chemicals in your head. So that brings us to now, I suppose. Honestly, the end caught me by surprise. I'd concentrated so much on just putting one foot in front of the other that when I finally looked up and noticed I was standing in daylight on the other end of the tunnel, I couldn't believe it. I had a funny exchange with my agent after I sent him the final PDF where I just kept repeating "am I done? Oh man, is this thing done? I can't be done. Is it really done?" Is it a Pyrrhic victory? Will the book be overlooked now that so much time has passed? I don't know. I hope not, obviously, but I certainly don't expect a repeat of the buzz that surrounded the first issue. Which is probably a good thing, because it'll be a lot easier to concentrate on #3. There's a lot of other stuff to talk about (plans for Nonplayer and the future in general), but I'll stop here for now. I'm happy right now, guys. Thanks for waiting. Go Misael! Hope all is good with you and your family! Man, I don't know how folks with kids find the time to go to cool stuff like TAG. I am certainly with you in spirit! Well, you are a NOT a failure. Each page, issue and project completed are a testament to your success. Each morning awoken with the decision to keep telling your story YOUR WAY are a success and your family supporting you is a HUGE success in itself. Keep doing what you do. I'll keep buying! Aw thanks man. Your comment gave me warm feelings. I can honestly say the same about you, Mark! It's been too long. We need to have another crab massacre with Cory, DRP, and Jordan, yeah? This post speaks volumes to the feelings that I and anyone else have about working on a personal project that doesn't pay the bills. Working on a personal project that you don't want to compromise on to the point where you would rather it never get done at all. I'm glad you persevered. It means there's hope for the rest of us. Pressure and time, just like the man said. Good luck, B. F.! Aw thanks, Virginia! I didn't mean to make anybody cry! But yes, let us do dinner with the Robertses soon. Will you contact my social coordinator? Thanks again for being such a fountain of happy energy! Wow, it sounds like you went through a lot. I can definitely relate to the birth of your son focusing your creativity though. I experienced a similar thing with the birth of mine. Congratulations on finishing #2. I can't wait to check it out. Thanks Victor! Yeah, it's pretty mind blowing how that works. I was always so scatterbrained before Ian was born. Now I feel like a laser beam. A poop-covered laser beam. Nate, first and foremost thank you so much for sharing that publicly. As a fellow artist, I think we can all relate to your struggles and I think people tend to forget that we are also human and they don't realize how much of ourselves goes into our art and how time consuming it can be. The whole creative process can take a lot out of you and adding more pressure only adds to the frustration of getting something done. It can't be forced. With everything you have been going through in your personal life, I probably would have just given up. I don't know if you watched Avatar: The Last Airbender or Legend of Korra but there was this quote: "When we hit our lowest point, we are open to the greatest change" and that still resonates strongly with me so kudos for not giving up! I am extremely happy you are in a better place now and I am looking forward to what you have in store for us. You got me hooked on this amazing world you have introduced us to and I'm willing to wait however long it takes. You will always have people out there supporting you. I assure you it's well worth the wait, at least for me it is. ::cheers:: and happy holidays to you and your family! Thanks so much Eric! I'm happy that you liked the first issue and hopeful that you'll like the second one just as much. Cheers! I'm stoked! Thanks for sticking with it! Awesome! Is there some kind of webplace I can buy it? I think you can order the digital version through Comixology. Also, there's a reprint of #1 coming in April, which I think you'll be able to order online through Midtown Comics, if I'm not mistaken. oh man what AWESOME news! I loved issue #1 and I am so excited to read that issue #2 is only weeks away now. Thank you so much for sticking with it. Just re-read issue 1, can't wait for #2! Better late than never, good luck buck!